The Concrete Pavement (CP) Road Map is a comprehensive and strategic plan for concrete pavement research that will guide the investment of research dollars for the next several years. It will result in technologies and systems that help the concrete pavement community meet the paving needs of today, and the as-yet unimagined paving challenges of tomorrow. In short, the CP Road Map will result in a new generation of concrete pavements for the 21st century. Strategic—It combines more than 250 research problem statements into 12 fully integrated, sequential, and cohesive tracks of research leading to specific products that will dramatically affect the way concrete pavements are designed and constructed. Innovative—From the way it was developed, to its unique track structure and cross-track integration, to the plan for conducting the research, the CP Road Map introduces a new, inclusive, and far-reaching approach to pavement research. Stakeholder Involvement—This CP Road Map plan is for the Federal, State, or private concrete pavement community. Peers helped create it, so it reflects all needs. No cost or time limitations—In general, it is a 7- to 10-year plan with an estimated overall cost of $250 million. No ties to one agency or pot of money—Stakeholders with funds and expertise will pool their resources, jointly conduct and coordinate the research, and put the results into practice. The plan incorporates innovative, effective research implementation to quickly move useful new products and systems to the field. The Federal Highway Administration (FHWA) and the concrete pavement industry have commissioned a national research plan for the 21st century. Why is such a plan needed? For most of the 20th century, the same materials--portland cement, high quality aggregate, and water--were used in pavement concrete, with only minor refinements. It was a fairly forgiving formula that allowed some variations in subgrade quality, construction practices, and other variables without sacrificing pavement performance. For generations, the industry had the luxury of keeping traffic off new concrete pavements for several days, even weeks, while the concrete developed its internal design strength. Today's concrete mix designs must integrate a multitude of new, sometimes marginal materials, resulting in serious compatibility problems and reduced tolerance for variations. Motorists are more demanding. They will tolerate only minimal road closures and delays due to road work, increasing the need for new paving methods that allow road crews to get in, get out, and stay out. And motorists want smoother, quieter pavements, pushing the industry to control pavement surface characteristics. Highway agency focus has shifted from building new pavements to rehabilitating and maintaining existing ones, which requires different designs, systems, materials, and equipment. Environmental pressures --traffic congestion, drainage and runoff issues, etc.--are affecting mix designs and pavement construction practices. Highway budgets are being squeezed at every level. The pavement community simply has to do more with less. In this environment, the old system for constructing concrete pavements is not meeting today's demands. Pavement failures have occurred that were unheard of 25 years ago. The concrete pavement community cannot continue business as usual if it is going to meet the growing demands on highway construction and rehabilitation. The CP Road Map gives the community an opportunity to proactively reinvent itself through research. By 2015, the highway community will have a comprehensive, integrated, fully functional system of concrete pavement technologies that provide innovative solutions for customer-driven performance requirements. The project to develop the Long-Term Plan for Concrete Pavement Technology began in 2001 through an agreement between the Innovative Pavement Research Foundation and a team led by Iowa State University's Center for Portland Cement Concrete Pavement Technology (PCC Center). In May 2003, FHWA initiated a new agreement with the PCC Center to complete the work. The Transportation Research Board (TRB) Committee for Research on Improved Concrete Pavements acted as the project advisory panel. Twenty percent of total funding for the project was provided by Iowa State University. The concrete pavement industry and State departments of transportation provided valuable input to the CP Road Map and support its implementation. An Iowa State University-led team facilitated development of the CP Road Map. They developed a database of existing research and gathered input, face-to-face, from the highway community. The team identified gaps in research that became the basis for problem statements, which are organized into a cohesive, strategic research plan. The research database is a thorough catalog of recently completed and in-progress research projects and their products. If regularly updated and maintained, as recommended in the research management plan (described later in this brochure), the database will be a valuable resource for many years. To ensure the adoption and success of the CP Road Map, it was developed through a cooperative process involving high levels of stakeholder teamwork. Five major brainstorming and feedback sessions were conducted by the Iowa team at the following events: the October 2003 meeting of the Midwest Concrete Consortium in Ames, IA; a special November 2003 regional workshop for eastern and southern stakeholders in Syracuse, NY; the May 2004 meeting of the American Concrete Pavement Association in Kansas City, MO; a special January 2004 regional teleconference for western stakeholders; and, in October 2004, a final meeting of national stakeholders hosted by FHWA at the Turner-Fairbank Highway Research Center in McLean, VA. Through these events, plus special presentations at more than 20 professional conferences and workshops across the country, more than 400 engineers and managers provided direct input into the CP Road Map. State and local departments of transportation. American Concrete Pavement Association, including several State chapters. 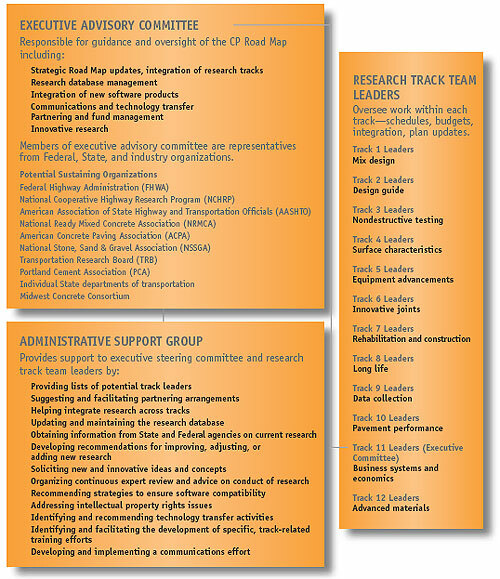 TRB/National Cooperative Highway Research Program committees. National Association of County Engineers. Research universities especially departments conducting applied research. Again and again, stakeholders who participated in these brainstorming events said they needed more and better analysis tools for measuring the hows and whys of pavement failures and successes--that is, to measure pavement performance. Better quality assurance and quality control methods/tools are needed for every stage of the pavement system, particularly mix design, design, and construction. Because variables in each stage affect the others, the methods/tools must be integrated across stages. By 2015, the highway community will have a comprehensive, integrated, fully functional system of concrete pavement technologies that provides innovative solutions for customer-driven performance requirements. Integrate design, mixtures and materials, and construction with pavement performance predictions. Identify new and innovative business relationships to focus on performance requirements. Expand opportunities to use concrete pavement. The objectives were "filtered" through the project team's database of existing research to determine gaps in research. These gaps became the basis for problem statements. Approximately 250 problem statements were written, reviewed, and fine tuned. Final versions of the problem statements were added to the research database as work to be accomplished via the CP Road Map. Research problem statements, projects, budgets, timelines, and research results in the database must be regularly updated. The CP Road Map will succeed only if the database is managed and maintained. Most of the 250-plus problem statements did not neatly fit into just one of the brainstorming categories (mixtures and materials, design, construction, and pavement management/business systems).To capture the cross-categories and the integrated nature of the problem statements, the problem statements were organized into 12, product-focused tracks of research within the database. This structure encourages various stakeholder groups to step forward as champions for a specific track. Each problem statement is a topical summary only. Most problem statements will be further broken down into specific research project statements that provide detailed descriptions of the research to be accomplished, budgets, and timelines. 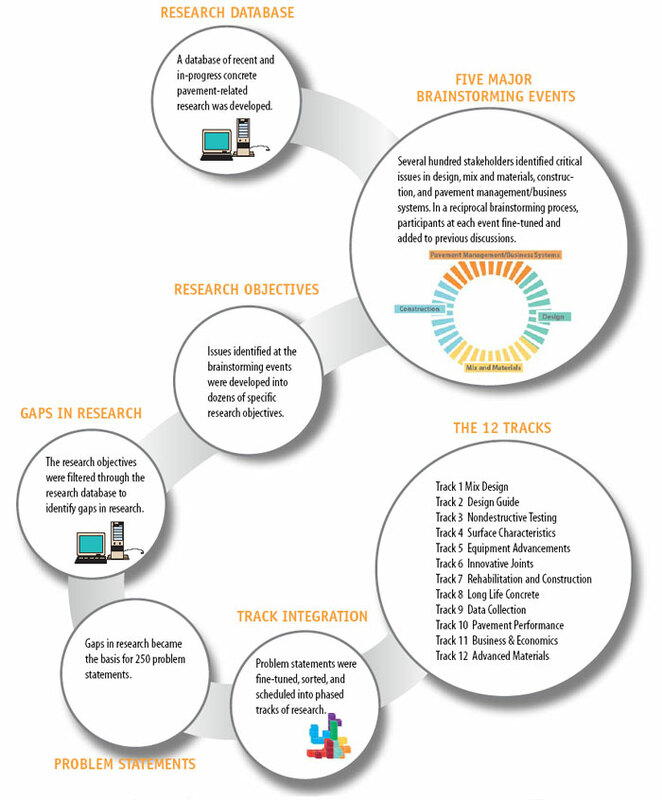 The research management plan (described later in this document) makes research track team leaders responsible for data entry of detailed project statements into the database. As noted in the 12 brief track descriptions on pages 8-11, research in one track often affects or is affected by research in another track. In the CP Road Map, this interdependence and other critical relationships are outlined in the track and problem statement descriptions. It will be the responsibility of research track team leaders, as described later in this document, to ensure that research is appropriately coordinated and integrated. Moreover, the research database can be sorted to isolate problem statements on a variety of subjects. For example, several important problem statements related to foundations and drainage systems, maintenance and rehabilitation, and environment advancements are included in various tracks. In the CP Road Map, problem statements related to these particular topics have been listed in separate cross-reference tables. Each of the CP Road Map tracks is a full research program in itself, with its own budget, 2 to 7 subtracks, and as many as 20 problem statements. Tracks 1 through 9 consist of timed sequences of research leading to particular products that are essential to reaching overall research goals. In the CP Road Map, one subtrack in every phased track is devoted to developing innovative technology transfer, training tools, and methods to ensure that innovative research products are quickly and efficiently moved into practice. Tracks 10, 11, and 12 are not phased because timing is not as critical. The products developed through the first four tracks may be especially critical to helping the industry achieve the full potential of concrete pavements. Performance-Based Concrete Pavement Mix Design System. The final product of this track will be a practical yet innovative concrete mix design procedure with new equipment, consensus target values, common laboratory procedures, and full integration with both structural design and field quality control--a lab of the future. This track also lays the groundwork for the concrete paving industry to assume more responsibility for mix designs as State highway agencies move from method specifications to more advanced acceptance tools. For such a move to be successful, it is important that the concrete paving industry and owner-agencies refer to a single document for mix design state-of-the-art. Performance-Based Design Guide for New and Rehabilitated Concrete Pavements. Under this track, the concrete pavement research community will expand the mechanistic approach to pavement restoration and preservation strategies. This track builds on the comprehensive work done under NCHRP 1-37A (development of the Mechanistic-Empirical Pavement Design Guide) and continues to develop the models from that key work. The work in this track needs to be closely integrated with track 1. High-Speed Nondestructive Testing and Intelligent Construction Systems. This track will develop high-speed, nondestructive quality control systems to continuously monitor pavement properties during construction. As a result, on-the-fly adjustments can be made to ensure the highest quality finished product that meets given performance specifications. Many problem statements in this track relate to both tracks 1 and 2. Optimized Surface Characteristics for Safe, Quiet, and Smooth Concrete Pavements. This track will result in a better understanding of concrete pavement surface characteristics. It will provide tools for engineers to help meet or exceed predetermined requirements for friction/safety, pavement-tire noise, smoothness, splash and spray, wheel path wear (hydroplaning), light reflection, rolling resistance, and durability (longevity). Each of the functional elements of a pavement listed above is critical. The challenge is to improve one characteristic without compromising another characteristic, especially when it comes to safety of the public. Equipment Automation and Advancements. This track will result in process improvements and equipment developments for high-speed, high quality concrete paving equipment to meet the concrete paving industry's projected needs and the traveling public's expectations for highway performance in the future. Examples include the next generation of concrete batching and placement equipment; behind-the-paver equipment to improve curing, surface treatment, jointing, etc. ; mechanized ways to place and control subdrains and other foundation elements; equipment to remove/replace the slab in one-pass construction; improved repair processes that decrease the time of operations and provide the workforce and traveling public with less exposure; and methods for evaluating new equipment on actual construction projects. Innovative Concrete Pavement Joint Design, Materials, and Construction. Potential products for this track include a new joint design, high-speed computer analysis techniques for joint performance, a more accurate installation scheme, and faster rehabilitation strategies. The problem statements in this track address the basics--joint design, materials, construction, and maintenance activities. The track also specifies research that will help develop breakthrough technologies and extremely high-speed joint repair techniques. This is a crosscutting track to ensure that all topics related to innovative joints are addressed. Much of the proposed research will develop important incremental improvements. In the CP Road Map, one subtrack in every phased track is devoted to developing innovative technology transfer, training tools, and methods to ensure that innovative research products are quickly and efficiently moved into practice. Tracks 10, 11, and 12 are not phased because timing is not as critical. High-Speed Concrete Pavement Rehabilitation and Construction. Faster techniques and higher quality can and must be accomplished in the future. This track addresses a series of activities,from the planning and simulation of high-speed construction and rehabilitation,precast and modular options for concrete pavements, and fast-track concrete pavement construction and rehabilitation, to the evaluation and technology transfer of high-speed construction and rehabilitation products and processes developed through research. Some high-speed construction issues will likely be investigated in tracks 1 and 3,and those efforts will be closely coordinated with this track. Long Life Concrete Pavements.The need for pavements that last longer between maintenance, restoration, or rehabilitation is integrated throughout the CP Road Map. However, this track draws attention to some specific research that may address pavement life approaching 60 years or more. Concrete Pavement Accelerated and Long-Term Data Collection.This track provides the infrastructure "data collection and reporting tools, testing methods, etc." for a future national program that will plan accelerated loading and long-term data needs, construct test sections, and collect and share data. The problem statements in this track will explore which data are most useful and determine the amount of time needed to collect the data. Concrete Pavement Performance. This track addresses key elements of pavement management and asset management systems. Such systems determine if and how pavements meet performance characteristics for highway agencies and users. Research in this track will determine and address the functional aspects of concrete pavement performance, particularly factors such as pavement-tire noise, friction, smoothness, and others. Research also will provide rapid concrete pavement performance feedback and examine ways to schedule surface characteristics and condition improvements. Developing feedback loops in highway agencies' pavement management systems will be crucial to monitor performance effectively and rapidly. 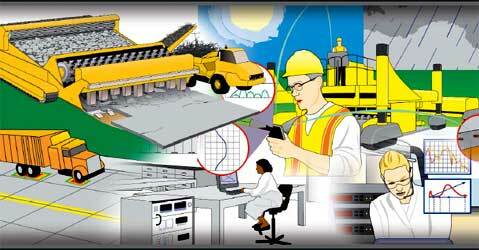 Concrete Pavement Business Systems and Economics. Roles and responsibilities are changing in the highway industry, affecting the way paving projects are designed, bid, built, and maintained .Contractors are being asked to assume more control of the operation and quality control inspections. By including warranty provisions in project contracts, owner-agencies are asking for additional assurance that pavements will be built and will perform as expected. Internationally, many countries have made dramatic changes in project funding methods and in the roles of contractors and suppliers. This track captures some important research that should be considered as this process of transformation continues in the United States. Problem statements cover contracting options, new technology transfer systems, public-private partnerships, economic models, etc. Advanced Concrete Pavement Materials.The problem statements in this track address the development of new materials and refine or reintroduce existing advanced materials to enhance performance, improve construction, and reduce waste. Many of the existing materials studied in this track have been used thus far on a small scale or in laboratory evaluations only. Many of them have not been used in the United States but show promise based on work done in other countries. This track will experiment with such materials on a larger scale and will develop standards and recommendations for their use. The research will foster innovation in the development of additional, new, and innovative concrete pavement materials. The CP Road Map is accompanied by a research management plan that outlines a progressive, cooperative approach to managing and conducting the research. Under this plan, organizations identify common interests, partner with one another in executing specific contracts, and, in the end, produce and share a product that is greater than the sum of the parts. The CP Road Map is a national research plan, not a plan solely for FHWA, but for State agencies, and the industry as well. The CP Road Map is not restricted to any single funding source. Publicly financed highway research is decentralized and will probably remain so through the next highway bill. Even in a decentralized arena like research, it is possible--indeed, critical--for stakeholder groups to come together voluntarily. Federal, State, and industry research staff and engineers around the country are looking for more opportunities to pool their funds and other resources in win-win situations. The Midwest Concrete Consortium is an example of a successful cooperative approach to research. The all-too-common disconnection between research results and implementation of those results must be fixed. Communication, technology transfer, and outreach activities must be elevated to the same level of importance as research itself. The CP Road Map is too comprehensive and too important for a part-time implementation effort. Managing the overall research program effectively and judiciously will require full-time, dedicated personnel with adequate resources. In line with this general philosophy, the research management plan outlines a four-tier system of participation and responsibility: an executive advisory committee, an administrative support group, research track team leaders, and sustaining organizations. Assembling research track team leaders. Ensuring adequate integration of research across tracks. Developing and implementing a strategy to ensure that software products developed through various research tracks will be compatible with each other. Identifying new research program areas. Overseeing updates to and maintenance of the research database. 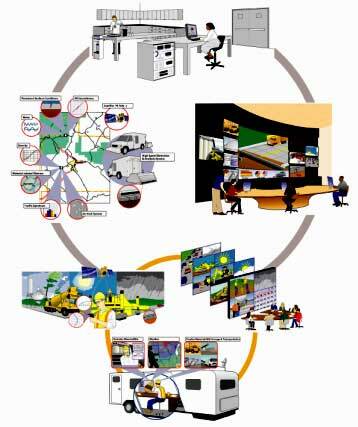 Developing a comprehensive technology transfer and training program for products of the CP Road Map. Developing a communications effort to keep the CP Road Map and its products in front of stakeholders and the public. Keeping the momentum focused on outcomes, not just output. An administrative support group will provide professional management services for the executive advisory committee and, to a lesser degree, the research track team leaders. It will be the "doing" body for coordination and support activities, like maintaining the research database. Validating and updating the track. Developing broad problem statements into specific, separate research projects, with scopes of work, timelines, and budgets. Identifying organizations to conduct or partner in the research. Establishing and overseeing subordinate technical expert working groups to guide complex work. Ensuring proper integration of work within the track and across track lines. Sustaining organizations--agencies, consultants, universities, professional associations, and other organizations with specialized interests and skills that are interested in pooling dedicated funds--will assume responsibility for conducting research through cooperation, partnerships, and funding agreements. Some people and organizations will assume multiple roles. In addition, sustaining organizations conducting research under the CP Road Map may retain full fiscal and technical control of the work under their jurisdictions. The key to successful conduct of the research, however, is cooperation, and the research management plan facilitates and supports cooperative efforts. The CP Road Map is a 7- to 10-year plan for concrete pavement research consisting of the following tracks and subtracks. The general range of costs associated with each track represents the time dedicated to the CP Road Map by multiple stakeholders who contributed to its development. The support needed for this effort comes from in-kind services and funding provided by a number of participants including industry organizations, State departments of transportation, and Federal agencies. These estimates are subject to change as the CP Road Map evolves. Portland Cement Concrete (PCC) Mix Design System Development and Integration. PCC Mix Design Laboratory Testing and Equipment. PCC Mix Design Evaluation and Implementation. Design Guide Inputs, Performance Models, and Reliability. Special Design and Rehabilitation Issues. Nondestructive Testing and Intelligent Control System Evaluation, and Implementation. Concrete Pavement Texture and Friction. Integration of Concrete Pavement Surface Characteristics. Evaluation of Products for Concrete Pavement Surface Characteristics. Concrete Pavement Surface Characteristics Implementation. Other Concrete Pavement Surface Characteristics. Concrete Batching and Mixing Equipment. Concrete Pavement Curing, Texturing, and Jointing Equipment. Advanced Equipment Evaluation and Implementation. Joint Materials, Construction, Evaluation, and Rehabilitation Innovations. Rehabilitation and Construction Planning and Simulation. Precast and Modular Concrete Pavements. Rehabilitation and Construction Evaluation and Implementation. Pavement Strategy for Long Life Concrete Pavements. Construction and Materials for Long Life Concrete Pavements and Overlays. Long Life Concrete Pavement Implementation. Planning and Designing Accelerated Loading and Long-Term Data Collection. Materials, Construction, Monitoring, and Reporting on Testing. Accelerated Loading and Long-Term Data Collection Implementation. Technologies for Determining Concrete Pavement Performance. Guidelines and Protocols for Concrete Pavement Performance. Concrete Pavement Research and Technology Management and Implementation. Concrete Pavement Economics and Life Cycle Costs. Concrete Pavement Decisions with Environment Impact. Beginning a long-term research program is a long, slow process. In this case, the CP Road Map provides a framework for moving forward. To receive a printed copy of the full two-volume CP Road Map, with complete problem statements (available mid-2005), contact Peter Kopac, Federal Highway Administration, 202-493-3151, peter.kopac@fhwa.dot.gov. An electronic version of the CP Road Map and the two-volume report will also be available on the Federal Highway Administration's Web site in mid-2005. See https://www.fhwa.dot.gov/research/tfhrc/. For additional information go to www.fhwa.dot.gov/research/tfhrc/ and search for CP Road Map.